﻿ Four Points by Sheraton Chicago O'Hare Airport, Chicago (IL) | FROM $80 - SAVE ON AGODA! "It was an awesome stay." Have a question for Four Points by Sheraton Chicago O'Hare Airport? "A 5 minute drive afforded us spacious, clean rooms, each equipped with two double beds, a nice-sized bathroom, and tiny balcony." "Each room had two lovely, comfortable double beds, something hard to come by, at a con." "Clean and comfortable at affordable cost." 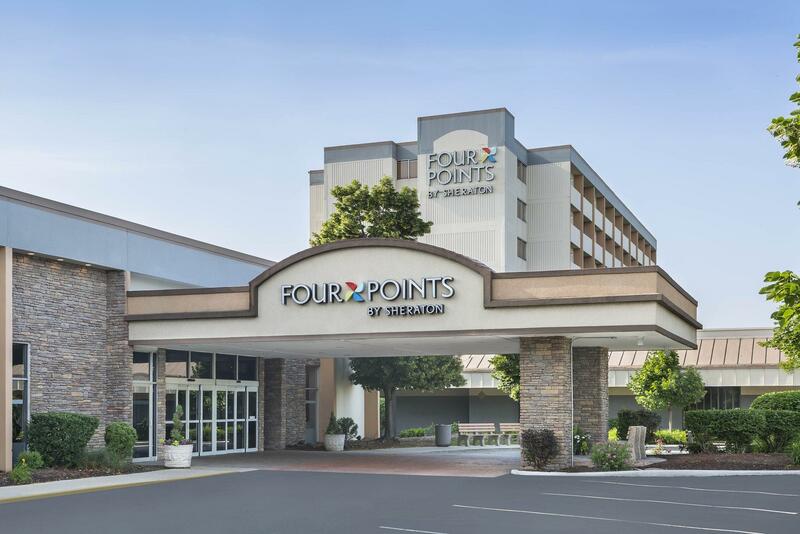 When visiting Chicago (IL), you'll feel right at home at Four Points by Sheraton Chicago OHare Airport, which offers quality accommodation and great service. From here, guests can enjoy easy access to all that the lively city has to offer. This modern hotel is in the vicinity of popular city attractions such as NS Macaron, Brookstone, Chicago O'Hare International Airport. Four Points by Sheraton Chicago OHare Airport offers impeccable service and all the essential amenities to invigorate travelers. Free Wi-Fi in all rooms, daily housekeeping, gift/souvenir shop, taxi service, 24-hour front desk are just a few of the facilities that set Four Points by Sheraton Chicago OHare Airport apart from other hotels in the city. Guests can choose from 295 rooms, all of which exude an atmosphere of total peace and harmony. The complete list of recreational facilities is available at the hotel, including hot tub, fitness center, indoor pool. Superb facilities and an excellent location make the Four Points by Sheraton Chicago OHare Airport the perfect base from which to enjoy your stay in Chicago (IL). "The bed is great and wonderful staff." This is a really nice hotel and convenient to ORD airport. The hotel was super clean as well as the indoor pool which we love. They have a restaurant/lounge attached to the hotel which has good food and the prices are reasonable. They have a 24 hour bus shuttle to and from the airport which was a winner for us. At the airport you can get on the subway or train and ride into the city which is a big plus to avoid tolls and traffic. There is a BP convenient mart located just a short 5 minute walk from the hotel. We would also note that Chicago is a Great city to visit but you will need two to three day's. We had a positive experience staying at the hotel and would be happy to stay there again. The bed is great and wonderful staff. At peak hours, one might have to wait for the next shuttle. Flight crews get priority seating. They staff were incredibly nice, the location is great.. but the pick up service never arrived so I lost one hour of sleep out of my 5 possible hours :(. I had to pay a taxi to take me to the hotel even though I did request the pick up and I did send them all my flight info. The AC didnt work, but i had a nice repair man that got it fixed under 15 min.. From all the other choices the price is ok compared to the other ones in the near by. Nice rooms and the food was good. It was convenient and easy with all the amenities we needed, wi-fi, bar, restaurant and airport shuttle. We stayed twice in the period of a week because the facility was good and the late shuttle access worked for us. I needed one day or two stay in Chicago and wait for my flight. The free shuttle bus form the hotel and the airport runs frequently ,and it is a definite plus. Hotel's room and bed was comfortable .especally I like the smile from the reception ladies . A little disappointment was no free breakfast and the restaurant server looks like busy and needed me to wait to order foods. The building wasn’t up to standards of all the other Starwood properties I’ve stayed at before, very let down when I walked inside. The hotel is basic but comfortable. Particularly comforting after a long flight is how friendly the staff in the restaurant are. Just the soothing touch to ease the pain of too many hours on planes! Close to the airport, decent gym, first time I've seen a pool with a wheelchair lift! I had a pleasant though brief stay. Rooms nothing to get excited about, but they were fine. It was an awesome stay. The room was great and so what the staff. All rooms are not inclusive of breakfast, even if you want to pay for it. Everything is charged ... local phone calls, TV programs. With the same or lower rates, one can get a better hotel within the same area. We stayed at the Four Points for Anime Central, the midwest's biggest anime convention, for the first time this year. The Four Points is a bit further out from the con than the hotels in the Rosemont Entertainment district, which are walking distance from the Donald E. Stephens Convention Center. That being said, the hotel totally met our needs. A 5 minute drive afforded us spacious, clean rooms, each equipped with two double beds, a nice-sized bathroom, and tiny balcony. As we were still hot glueing cosplays, we actually opened up and used the balconies. We paid less than we would have for the same rooms, had they been at Aloft, or DoubleTree or Embassy Suites, and our group was comfortable, (AND saved quite a bit, which we then spent in the Dealer Room, dang it.) Four Points has a nice indoor pool, free internet and plenty of on-site parking ($10 per room per night). Each room had two lovely, comfortable double beds, something hard to come by, at a con. We didn't use the attached Mirage restaurant, as we spent most of our time at the con, and the eating places near there (Basil's Kitchen, yes. Morton's The Steakhouse, big fat no). The hotel is NOT walking distance to Rosemont, But if you have transportation, you will save big by staying here, and driving 5 miles into Rosemont. Large room, good stay on the whole just a reasonable way from airport, though maybe I was tired. Decent short stay. Liked it.